Well, in case you missed it…this happened. The whole house is doing well and feeling better…90% of the time. I’m finding that instead of cravings I have aversions. Our little adventurer has a strong will and sense of self preservation. The smell of beer is pretty nauseating and the taste of coffee is the same. Sadness. The aversion to beer is pretty easy to handle. The aversion to coffee is something to think about it and maybe wax about later. In happiness, these things are everywhere! Followed by daffodils and all sorts of greenery starting to sprout. Trees are still bud-less but that too will come all in good time. We went to a local park this morning and enjoy the sunshine seaside. The breeze from which is ear chilling cold. Note to self, the dangers of sitting seaside comes with a high risk for raising one’s sea-kayak desire level. Thankfully, we have no space for storage at the moment. Photos? You want a photo of this glorious seaside/kayak dreaming/breakfast spot? Ya’sure you betcha! …it is so cute that he thinks he’ll be able to avoid the camera. Of course, we are very optimistic about the turn in weather but ready for reality because between the last past and this one this too happened…3-4 inches of it. Always an adventure up here and always new surprises. Really, y’all should come and visit. No pictures this week but I can say that Spring has arrived….ish. According to the locals the weather we are getting here in April is typically what we should expect for March. And I must say that is it pretty darn nice. Spotted our first crocuses today and heard our first song birds (other than the return of the seagulls) which both have had uplifting effects on our spirits. Our sidewalks are cleared and 80% of the snow has melted. In the mountains though it is a good bet that they still have a fair amount of coverage. 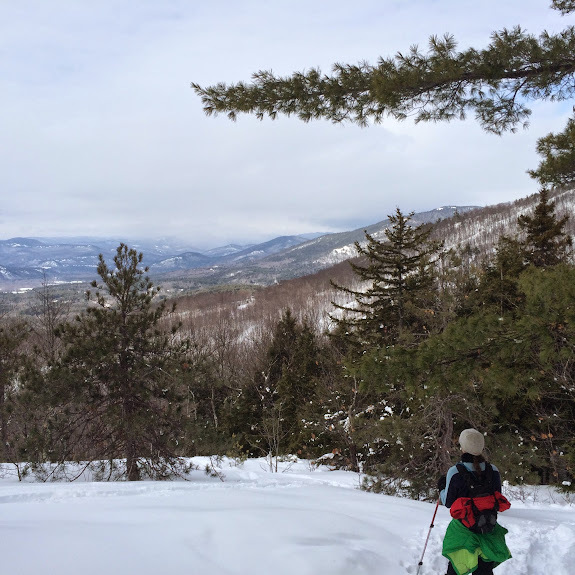 Here, yesterday was probably the last shot at actually skiing…and then, only in wooded areas. Despite all efforts otherwise, I must admit that we were a little “over” winter towards mid-March and are looking forward to milder days, trees budding and flowers springing up. The first Friday art walk was a pleasant outdoors experience and we finally hit up our local art museum. Something that will need to be revisited when the crowds are lower. They actually have an Alexander Caulder mobile!! You could have knocked me over when we turned the corner and there it was. So Spring-ish is bringing a lightness to our steps. 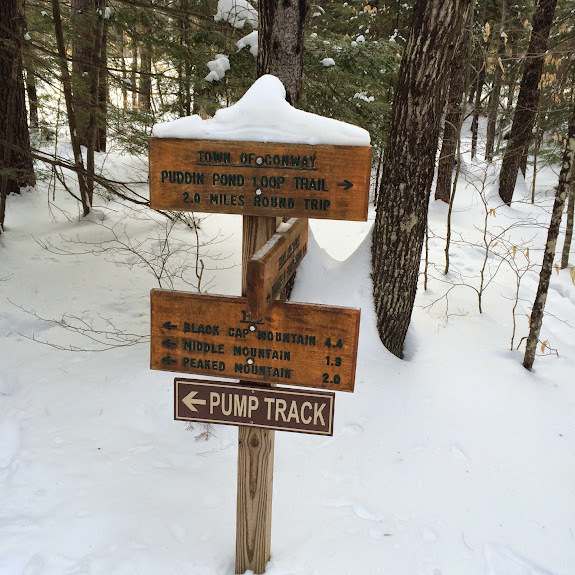 Maine gave us a good winter that hasn’t driven us away and we can happily say…Bring on mud-season! ….a couple of weeks ago. The weather looked acceptable (in the teens) so we headed for this destination. Peaked Mountain outside of Conway, NH. I’m demonstrating how to not put on snow shoes (mine are the mint green shoes with the blue gaiters on the right). Those straps that hold your foot in you want to face outward so that they don’t just irritate the frack out of you while you are walking. Silly newbie that I am, for what ever ergonomic reason they are easier to strap inwards for me but clearly that momentary ease does not make up for the long walk. New England has really been getting a lot of snow this winter. (On top of it being well below average cold.) But out in the woods with a little sunshine it is very beautiful. We reached our destination. May not be the highest elevation you see but surely beats a year ago. And the views were uncapturable (hush, I know that is not a word, English is an evolving language), although we did try. Other newbie mistake came in wearing too many layers. We ended up shedding several. Ryan shared with the me a factoid that mountaineers strive to not break a sweat, especially when they are in really cold climes, because the normal cooling mechanism will take it too far. No harm came to us but it was an interesting thought in trying to dress appropriately. 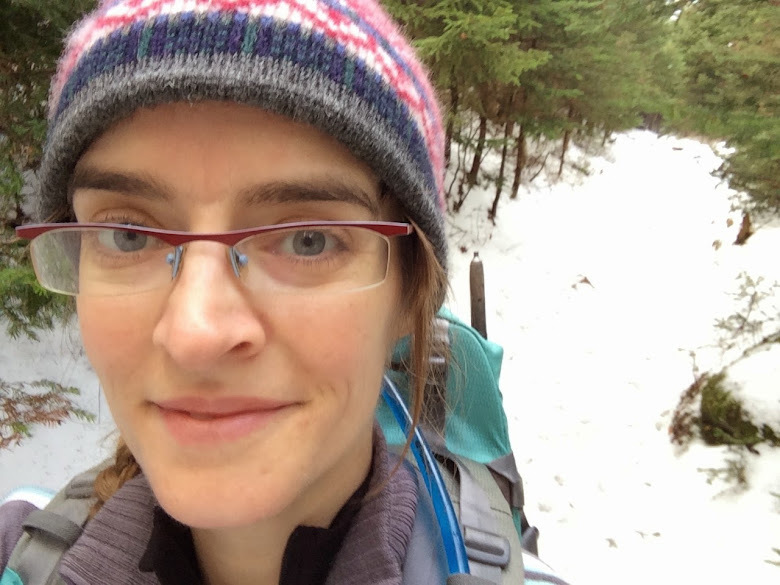 Really, for us, there are two hikes that feel quite different. The hike up and the hike down. All the layers we peeled off on the way up we put back on for the hike down. The elevation workout is still quite the cardio for us. And we still love every minute. I remember saying to check back in in February to see how we are still enjoying winter. Well, we still like it. The negative temps were a bit much. But I’m okay with more outdoor snow sports in March if we can keep the temps in the teens and 20s. Check again next year this time. S.o.S. am I an adult yet? First off, we survived the blizzard of 2015 quite well. Ryan got to stay at home and I walked to work. What was our main taking home point from walking in blizzard conditions? It would have been a lot more pleasant with ski goggles. You know how dogs get little snowballs stuck to their fur? Well, I was pulling those off my eyelashes. Crazy. Two, I had a moment where I thought I might have officially become an adult the other day. My mother and I were talking on the phone and I was giving her my opinion on a topic to which she did not like my opinion very much. To me, difference in opinions creates conversation and thoughts and may/not change a perspective or at least deepen one’s affirmation that they have made the right decision. I was reminded though of all the times that my mother has commented on how I never heed her opinion. Well, I’m pretty sure my opinion was not heeded and that did not bother me but did make me wonder does this make me an adult? Three, we went skiing again today and found that our kick-glides were more grunt-and-sort-of-make-forward-progress. Our blizzard snow was very “sugar”, ie powdery and dry. I do not know if this was the cause of the friction or if we have not had warm enough temps to cause it all to be icy. NE is known for wetter snow. Skiing was still fun but if we keep this ski hobby seriously then maybe we should invest into waxing skis in order to meet more appropriately with the conditions. Our legs are going to be VERY tired tomorrow. Four, no pictures this week. One might say I’ve had a case of the “camnesia”. But it seems that each time we would go out for picture worthy moments I have left my phone home to charge. Five, we are supposed to get 8-12 inches of snow tomorrow. (LoVE!!) But it does make me wonder where we are going to put all of this snow. The piles between the sidewalk and the street are already getting close to the point where I cannot see over them. It is a very exciting prospect. Hope these words find you and yours well. Here is a little “som”tin, “som”tin for ya. Been keeping busy around these parts. The snow is finally down in town so we could actually ski in the city at the municipal golf course. We don’t know how long the trail is but we are guessing around 4 miles. 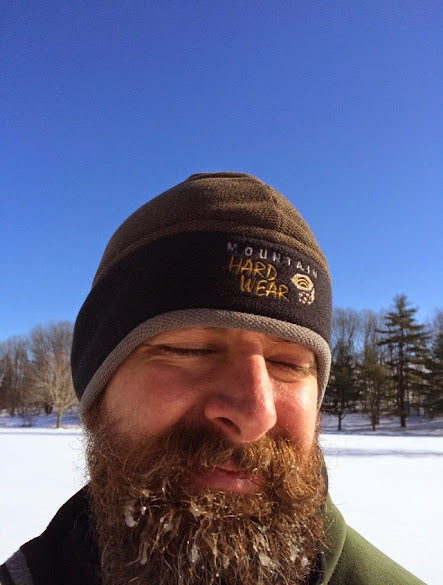 That is pretty darn nice even when it is so cold that your breath freezes to your beard. Doesn’t he look thrilled?…And adorable? Our Packers were in a playoff yesterday. 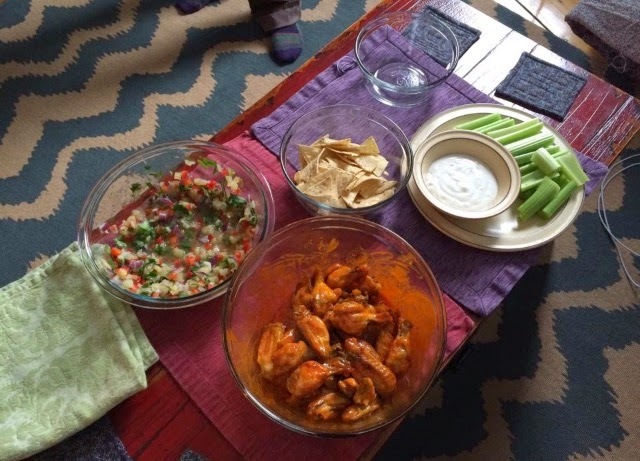 The Mr’s only request was for hot wings and pineapple salsa. With a face that adorable, who is to say no? Unlike years past in the playoffs, there are no jalapeno poppers or chocolate chip cookies (or Lakefront FixedGear Beer). We like to pretend that there is something healthy about all the sides but let’s be honest, the wings alone are killers. At least I don’t deep fry them and instead use the Alton Brown method of steam’em, fridge’em, bake’em, then tossin’em in hot sauce. The amount of liquid fat that melts off is a little horrifying and I’m still questioning if I could use the steam liquid as an addtion to chicken stock (waste not, want not). Any thoughts o’friends of the internet? In case you do not follow football, the Packer’s won and will be playing the Seahawks next Saturday. So it looks like I’ll be making this meal, Round 2, next week. (We are a superstitious bunch.) I also noticed that the Packer’s play better when I’m knitting as most of their great events occurred while I was finishing up this project. It is a hat for a co-worker’s newborn. In particular, the Packers played well while I worked on the i-cord button loop. 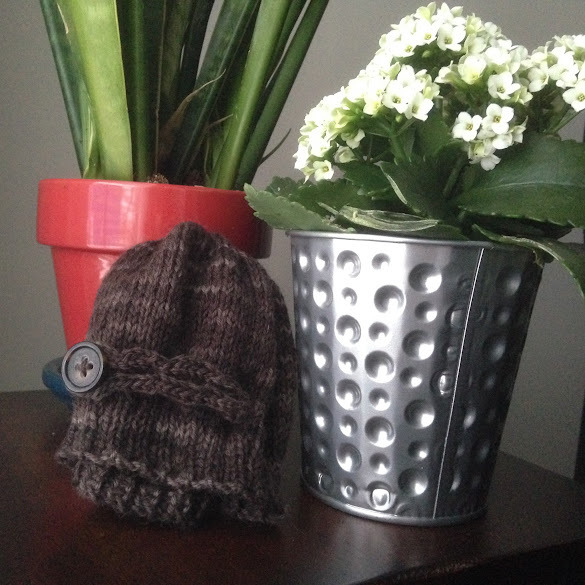 The hat knit a little too wide for a baby’s head and I thought to cinch it down via a big button. This happy accident really added a nice style element. So finally this little project can go onto little Henry and I need a new project for next week, obviously! That all said, I think I’m going to head out to my new favorite coffeehouse with some other crafty things to be done. 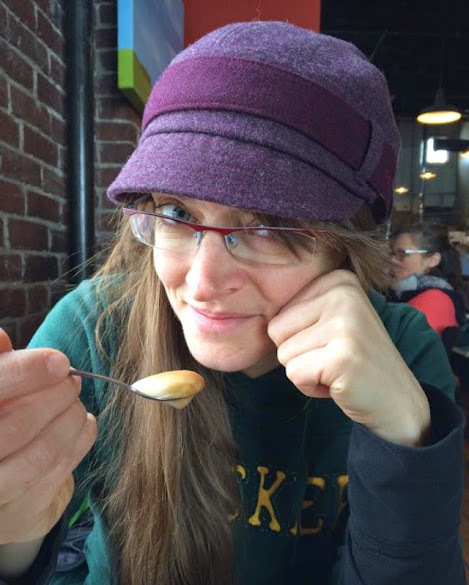 (A gal does need a whole list of coffeehouses to meet different needs.) This one is great for being a big open space with lots of windows, funky exposed brick, and most of all…really well made coffee. The crema alone is a dessert. C’est magnifique! Happy Monday to y’all. Maine is quite lovely in the winter if anyone dares come visit. You may recall that a couple of years ago I made our littlest nephews t-shirts with their initials on front and matching capes. These were a big hit…and continue to be a big hit despite the growing boys having to be squeezed into them. The request was made to upgrade their super-shirts…how could one refuse?! Upping the ante a little I played with knit on knit for a more flexible fit. Cotton on knit had more form and I didn’t have to worry about raveling edges. This was the first time knits met my sewing machine and thus involved a learning curve and maybe a few choice words…thank goodness for the internet in aid with choosing needles, foot selection, stitch selection, and how to work around a walking foot jamming at the most inopportune moment. I can see every imperfection but I doubt the boys will notice. 1. knit on knit. more flexible. 2. snap on capes for easy cleaning. 3. larger. t-shirts and longer capes..grow boys, grow! 4. we even included one for the newest niece. Given how much her brothers love her and playing with her it seemed only fitting. So I’m in my head dubbing them the SuperKids. Wish we could be there to see them open their gifts but it’ll have to wait until we visit some time outside of the crazy expensive holiday season travel. YES!!! Another hike in our ruby slippers accomplished this weekend. We revisited Mt. Kearsarge (3.1 miles, 2600 ft elevation gain) with snow all around. Being twice the distance of our first hike I feel like we are still learning about what works in terms of layering and what not for us. I definitely started out over dressed but did at one point lose all feeling in my digits. (I only got worried when this happened after the pins and needles of pain…bad sign.) A quick pull off of my gloves and applying a little skin to skin (thank you warm neck!) and I had pins and needles again then full feeling. Still not quite sure what happened to have my hands go cold so quickly when they were perfectly warm before and when they were still in their good gloves but there you have it. Certainly going to keep working on it until we can avoid the problem with different combinations. Enough! Onto the beautiful pictures!! Something about snow really appeals to me. It is quiet and peaceful and soft…for me, it is as though it (snow) is trying to soften the edges of a harsh world. The day we hiked was perfect. Mid-30s and blue skies. The higher elevations had snow on the trees, icicles and beauty as far as the eye could see. Ryan is standing uphill from me. The angle is actually quite acute. And the view from the fire tower was breath taking. We didn’t require snowshoes but, as mentioned, we did wear our microspikes. We avoided lugging our snow shoes by the advice of a couple of people finishing the trail as we were pulling into parking. They had spent the night on top. (I’m trying to talk Ryan into doing this too!) Most people had on crampons or spikes like us but we saw 2 people who hiked it in their tennis shoes. Maybe this could go without saying, but I’ll put it out there nonetheless…they were faster humans than me. I don’t know if I’ll ever become a faster hiker. It would be nice though. Think Santa could bring that gift to me for the holiday? Ryan’s workplace is pretty rocking. First a fun Halloween day and now an ugly sweater contest. 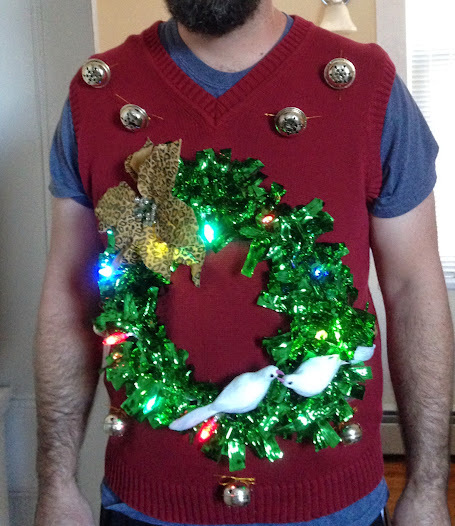 While Ryan made his own Halloween costume he elected to tap me in on making the ugly sweater. So one trip to the Goodwill followed by the Dollar store… all without any idea of what one wants to do… and we made great things happen. Here are the supplies gathered. The whole process was pretty simple. I just started attaching the accessories in a layered fashion to the sweater with a combination of thread, pins and stubbornness. Of course, the accessories really make it. I mean, who doesn’t need a leopard print poinsetta? topped off with battery powered LED lights. I don’t know if Ryan can win this contest because the sweater is supposed to be ugly and I find it to be quite cute. The first is the proclamation setting up Thanksgiving by Abraham Lincoln in 1863. (it is lengthy but I didn’t want to crop it for fear of losing the sentiment of the whole.) And the second is a quote by Martin Luther King, Jr. In the first quote we see that Thanksgiving isn’t about Pilgrims and Native Americans. It came about from a nation that had been and continued to suffer and mourn its losses. Growth does not occur effortlessly but comes under struggle and hard work. In the second quote I don’t know how some attitudes are any different than from the 1950s. There are still great divides of understanding between aspect of our country. So Thanksgiving wasn’t necessarily about Pilgrims and Native Americans sitting down together, although maybe it should really be more about the radical concept that really is. Have two different cultures sit down and learn about the struggles of the other. Then maybe we can find joint solutions. I have been disheartened by people who dismiss the rioting that is occurring. People who have been picking apart one man’s life and saying in absent of actually vocalizing the words that he deserved to die. Or by holding up examples of their “own” people suffering similar treatment to use that as a means of saying “why are we not more protected” or to diminish the experience of the other rather than to hold each other in sympathy.I have heard one friend threaten to “unfriend” people on FB who like or share ignorant opinions. But last I checked, the definition of ignorance dealt with a lack of knowledge to which the only cure it to confront and educate. Education is not always easy or accepted. There are some who believe in willful ignorance in order to remain comfortable in their status quo. But giving the opportunity like to think that people want to understand and their willfulness against it is because they do not have a bridge by which to cross over their ignorance. A mob mentality or sheep heard mentality can certainly sweep up those individuals who revel in chaos but the original spark that enflames a simmering anguish should not be ignored. And to questions deeply, not superficially, why it simmers is a difficult discussion necessary to be held to create a lasting resolution. On a daily life line, we spent Thanksgiving with strangers and new friends. A co-worker of mine invited us to share the day with them and their friends and family. We had a wonderful day of eating too much, drinking a little bit, playing a wicked game of Cranium and being grateful for what we have and what we can share. Elsa’s sweet potato casserole made an appearance and was a hit. Someone even requested the recipe. So the modified Virginia-Elsa recipe was shared. We Facetimed with family in Ohio and talked with family in Kentucky. My twin and I were finishing our versions of the SPC at the same time because we all know that it isn’t a holiday with any lineage of Simpson genetics if there is no SPC. We also had a lot of snow that started mid-day Wednesday and continued into the night but was done by 3 am. Unfortunately this left quite a few people without electricity and quite a few people who plough for a living working extra. We meandered around the neighborhood the following day and because it is an early snow it was heavy and wet. A lot of trees lost branches, others were sagging dangerously across electrical lines and other cables. But it was beautiful. Here is a view down the street. (the snow ploughs did a great job clearing the road!) Of wet snow stuck to our fence. And of where I would have liked to eat lunch if not for the inches of snow, the menacing tree and the cold. Feeling in a giving mood here is my general recipe. Of course, I’m prone to interpretative cooking. 4. mix topping ingredients together. put on top of potatoes in dish. Today marks our first snow hike in the Whites. We were smart enough to stop at the local gear shop and get some micro-spikes pre-hike. I’m calling them my ruby slippers. Click your heels 3 times and…wait, we are already home and we love it here! The elevation of Mt. Williard is under 3000ft. It is only a 1.5 mile hike up and the elevation gain isn’t too bad. Parking is right at the trail head. All of which makes it a popular hike with locals. We figured it would be a good starter hike to test out our layering/gear/preparedness/etc. And the views were not bad either. Lots of little waterfalls, streams, and the top view just kept going off into the distance with peaks and peaks of mountains. Turns out that my warmest hat is one my mom gifted me for Christmas when I was in high school from LLBean. Maybe I should consider going down the road and getting a new one? Nah, this one works just great. The micro-spikes were a good addition. We started our hike without them and certainly saw quite a few people hiking without any but once we put them on our footing was noticeably more secure. You could take longer strides. No forward progress was lost by sliding back with each step. Even walking across rocks in the stream felt less precarious. Who knows, I may make mine daily wear on my walk to work. The sidewalks are so roly-poly around here I can’t imagine a whole lot of effective shoveling once winter hits us in full force. One thing evident from our hike…I need to wrestle the camera from Ryan more often. Too many pics of me and not enough of him. Ah well…there is always the next adventure.